It’s always a shock that after months of getting ready, Quilt Market is over so quickly. It’s also a short day – in part because Market closes at 4:00 pm instead of 6:00 pm, and in part because many attendees start leaving by Noon to catch flights homes. The weather – it has made travel to Houston a little more challenging. There has been flooding in parts of Texas and the storm created many flight delays on Thursday and Friday. But so long as Sandy Klop – American Jane – is here, it’s all good. 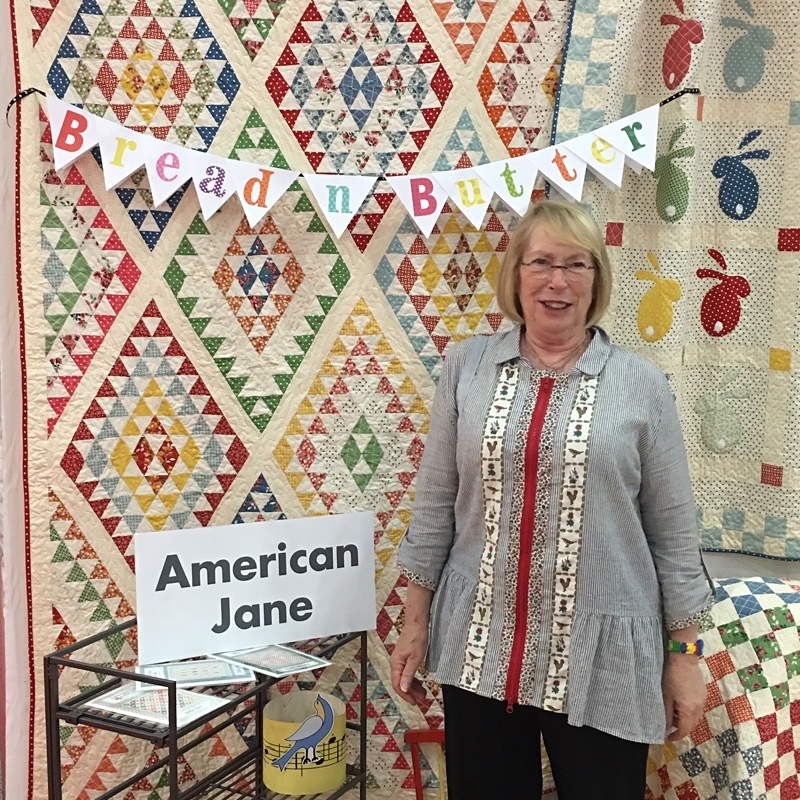 Sandy’s new collection is Bread ‘n Butter – yes, that probably explains the banner. 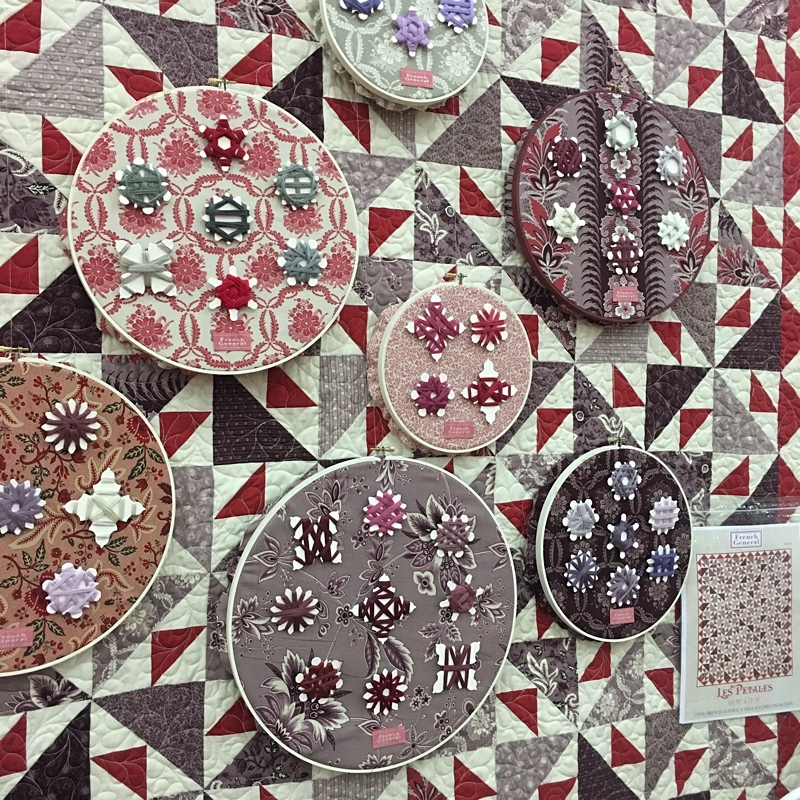 As always, Sandy’s quilts are some of my favorites. (I think it’s all those pieces.) This collection is colorful – yellow, orange, pink, two shades of blue and green – and it mixes feedsack-vintage feeling florals, geometrics and polka dots. 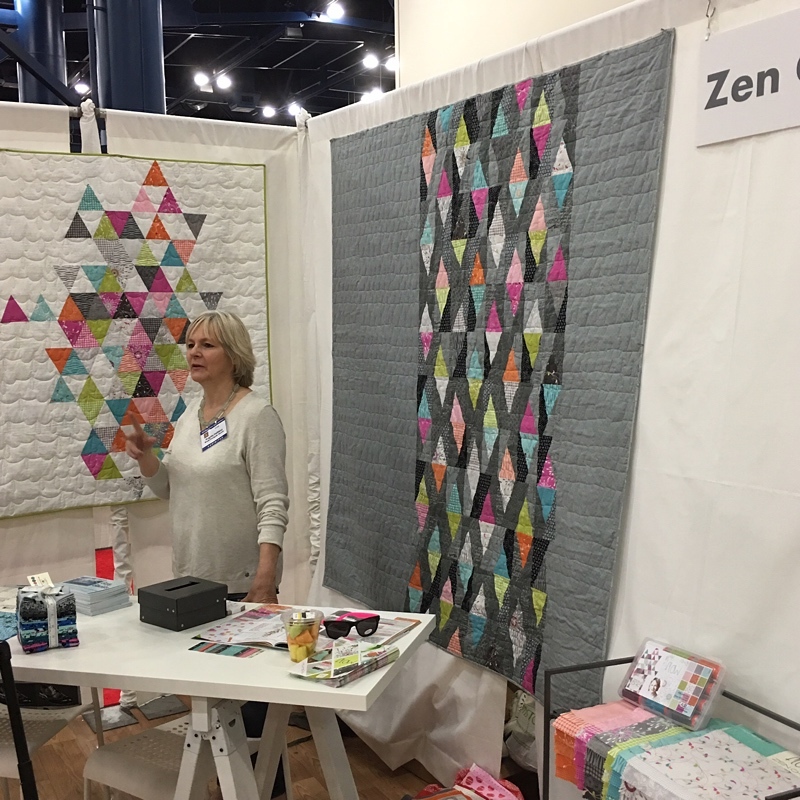 This is another of Sandy’s quilts – it’s across the aisle from her booth. If there’s a big blank space, it gets a quilt. Catching a moment with Brigitte Heitland of Zen Chic while she wasn’t busy was hard! I finally had to simply take pictures while she was speaking with customers and fans. 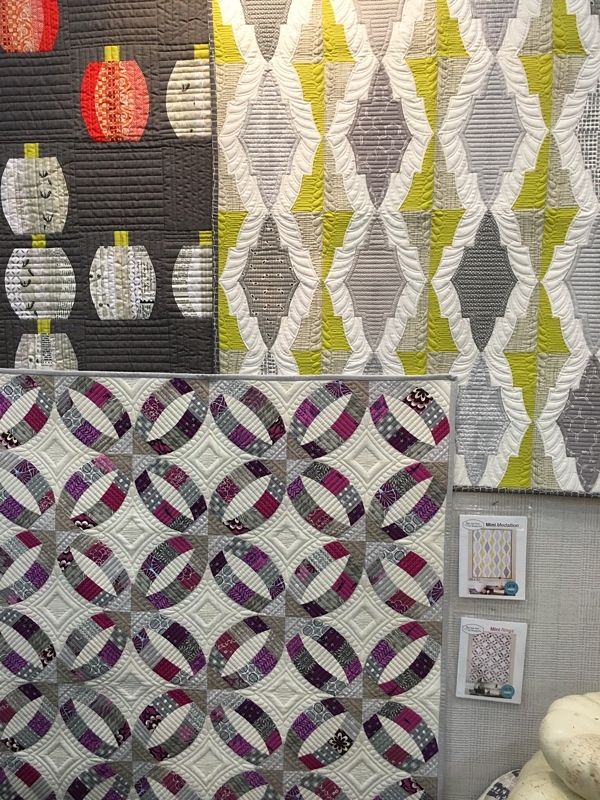 Both of these quilts are made with Brigitte’s new collection – Flow. Primitive Gatherings. It’s filled with quilts, wool and kits. Those are wool charm packs – 5″ x 5″ squares of wool or fabric – in the front – they’re perfect for getting a little bit of wool in an assortment of textures, all in a single color-range. Lisa loves working with charm squares so much that when she started producing triangle paper, she designed a 5″ x 5″ size paper specifically for using with charm squares. Pretty clever. 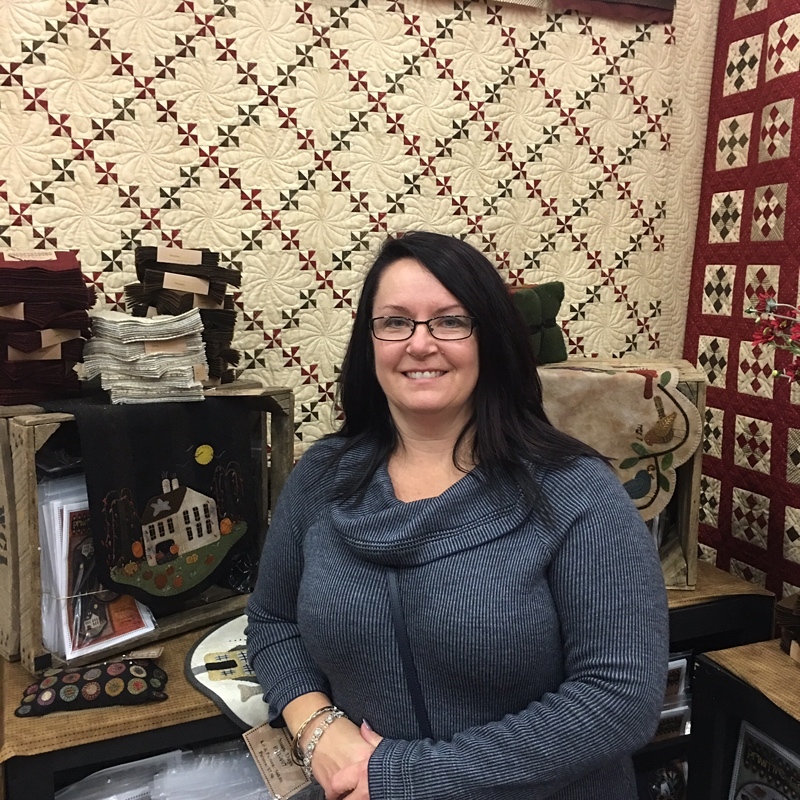 This is Lisa Bongean – the brains behind Primitive Gatherings. A long-distance “take care… get well soon… we miss you!” to Nick Bongean. Nick didn’t make the trip because he’s a teeny bit under-the-weather. 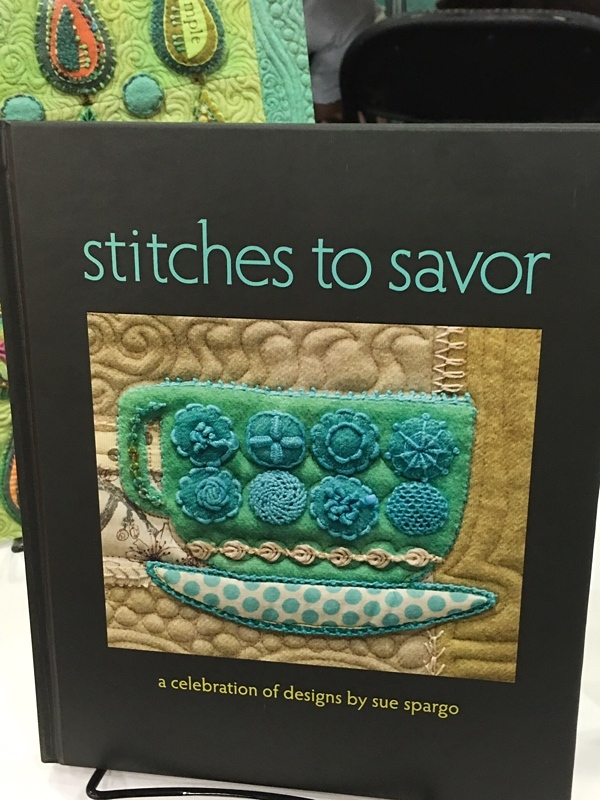 Now that all of the fabric designers are present and accounted for… these are some of the things that caught my attention while roaming Quilt Market. These are hanging in Kaari Meng’s booth – French General. The quilt is Les Petales. The fabrics are from the collection – they’re beautiful. Mounted on the fabrics are bobbin cards cut using a Sixxiz dye Kaari designed based on vintage French bobbin cards. While many of us have used a small thread-spool shaped card for winding stranded embroidery floss, the French use cards like these that allow winding the floss on cards in beautiful patterns. 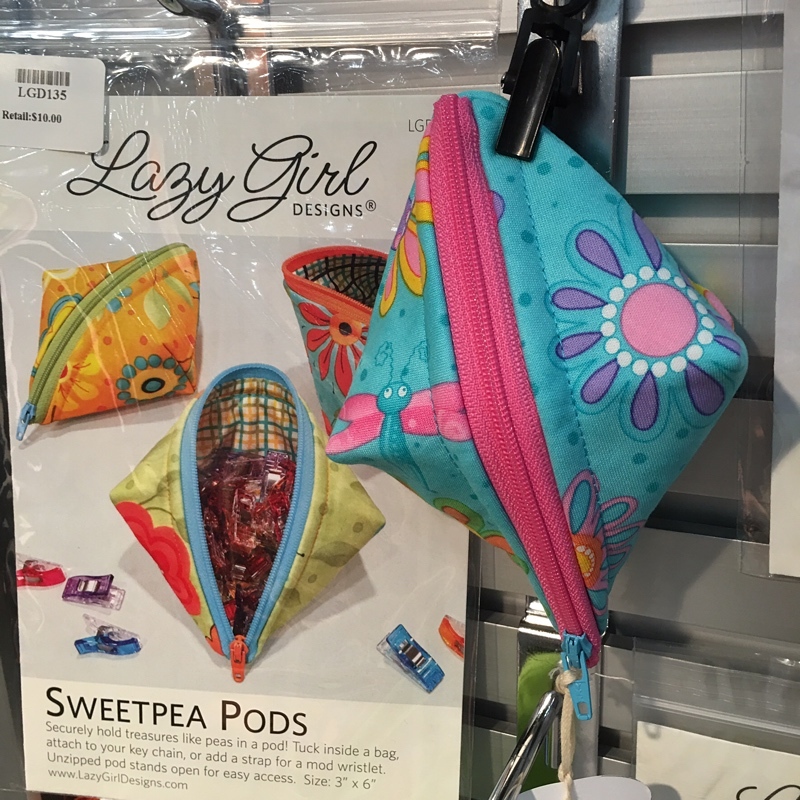 Joan Hawley – Lazy Girl Designs! How cute are these Sweetpea Pods? And please note the Zipper Pulls from Atkinson Designs – Joan uses those to add a color-pop to the zippers. 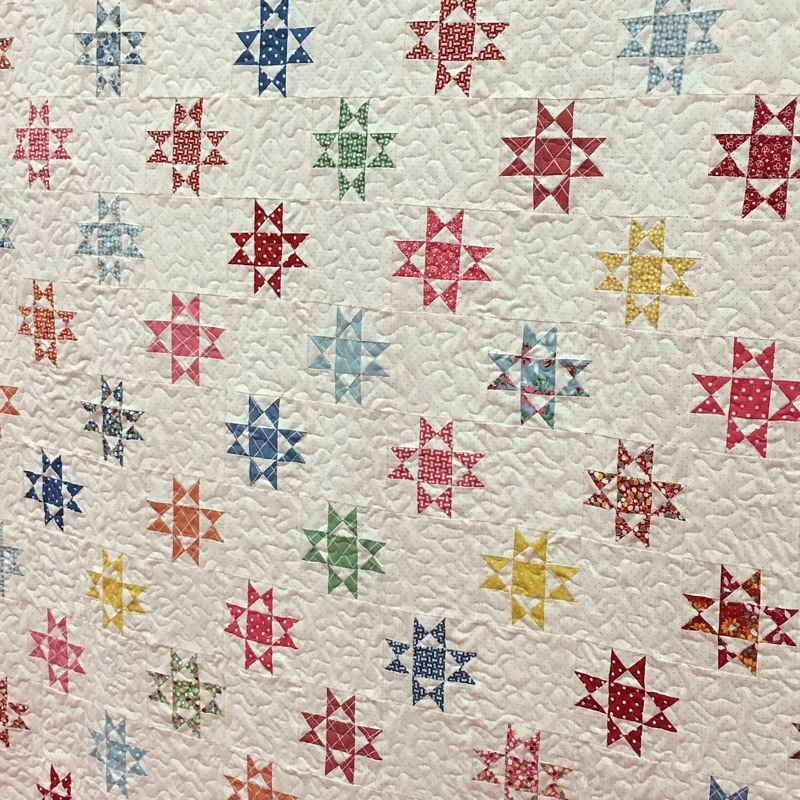 A few years ago, Amber Johnson of Gigi’s Thimble Quilt Patterns drafted a paper-piecing Pineapple block – from which she made a gorgeous scrappy Pineapple quilt. 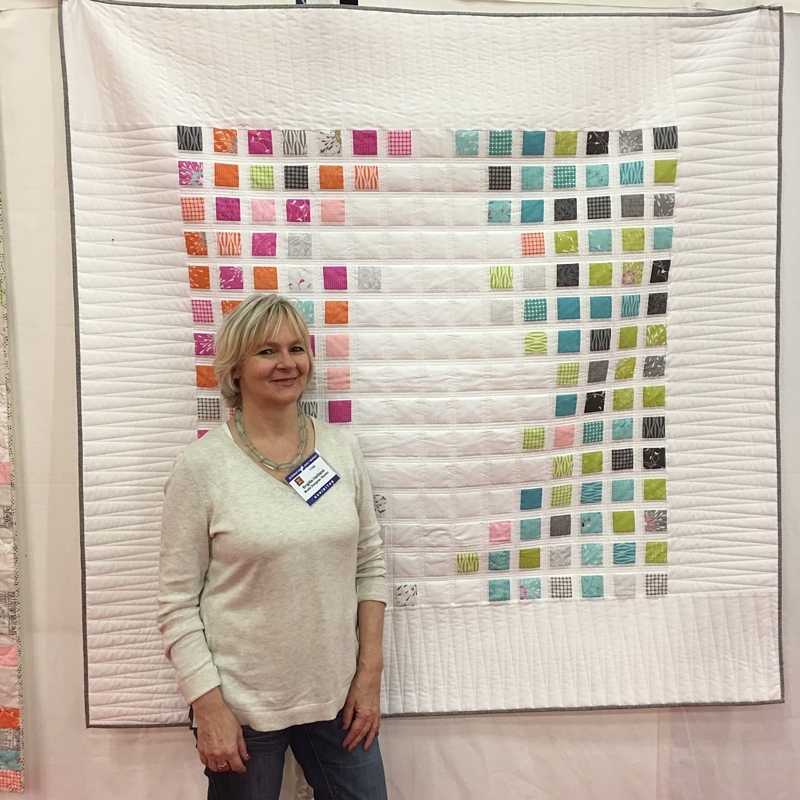 When Lissa Alexander from Moda was designing a quilt using Jen Kingwell’s new fabrics, she thought of Amber’s papers. 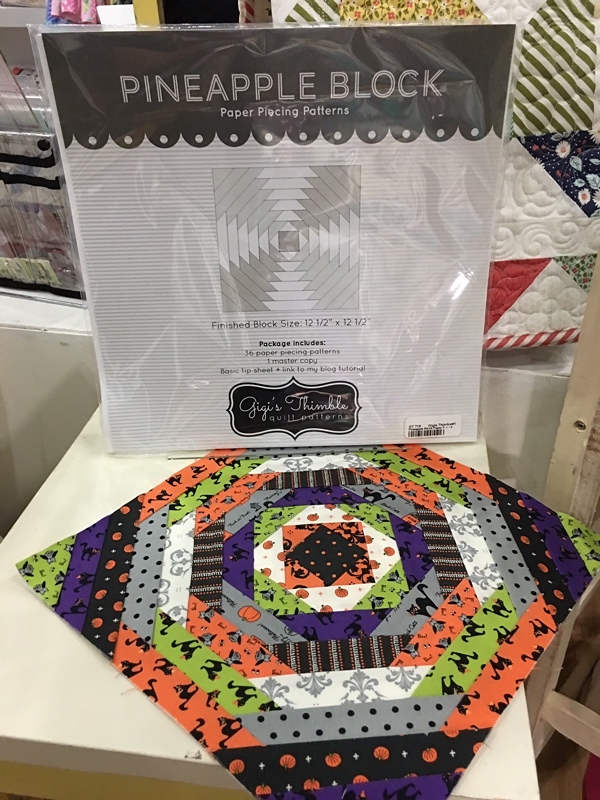 Even though the Lollies Pineapple kit will come with the papers, we loved these papers so much that United Notions started carrying them – it’s a package of 36 papers, enough to make a quilt measuring 72″ x 72″. The package includes a Master Copy of the paper that can be photo-copied if you’d like to make a larger quilt. This is an Advent Calendar designed by Wenche Wolff Hatling using her Jol collection. The rows of the “tree” have tiny rings attached so that small ornaments can be tied to the wall-hanging. 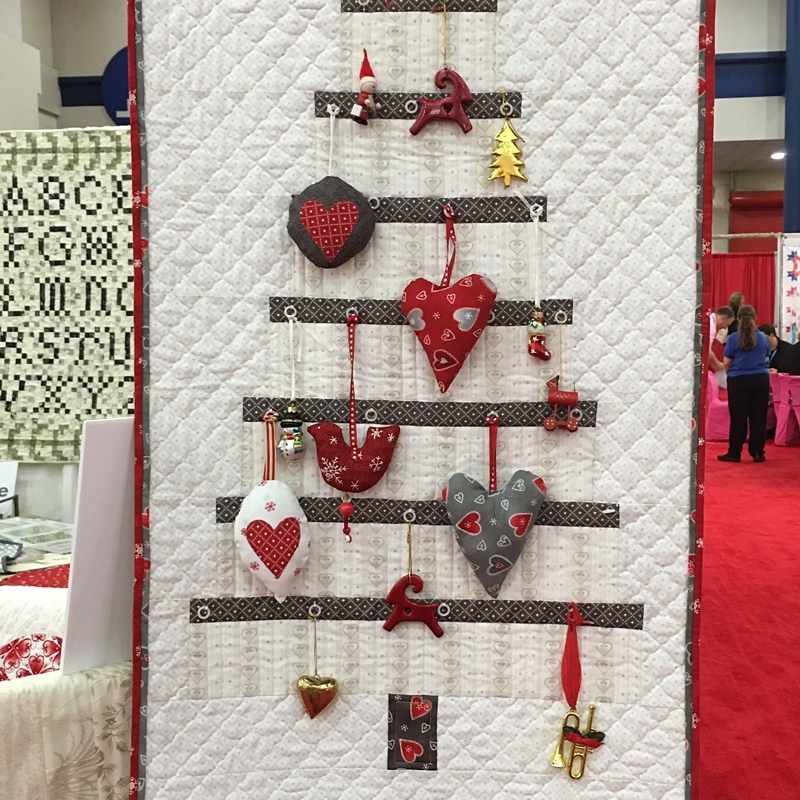 Wenche uses a lovely assortment of purchased and pieced ornaments for her tree – the pattern includes the hearts and birds. 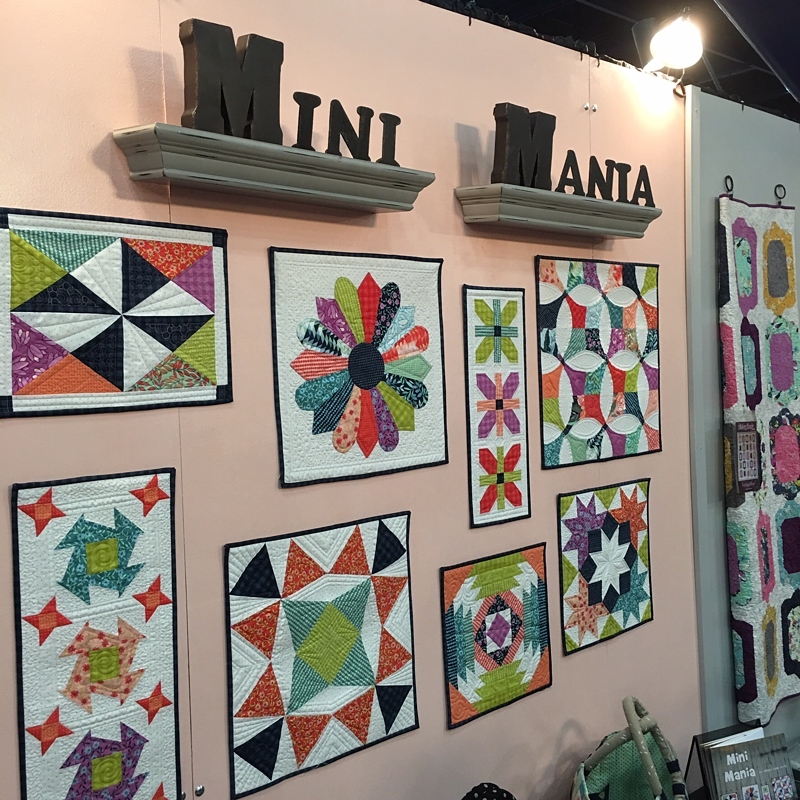 The ladies of Abbey Road Quilts have a new book Mini Mania. Since it was also Mini Tucker Prairie Mania, we love it! Okay, the quilts are so cute that we’d love it anyway. The Tucker Prairie by OneCanoeTwo – shipping any day now – just makes it better. Mochi by Natalie Barnes of Beyond The Reef Patterns. This is made with Jen Kingwell’s Lollies and Behind the Scenes collection. I always love Natalie’s quilts and patterns, she has a very original modern style. Jenny Perdigo of Sew Kind of Wonderful. 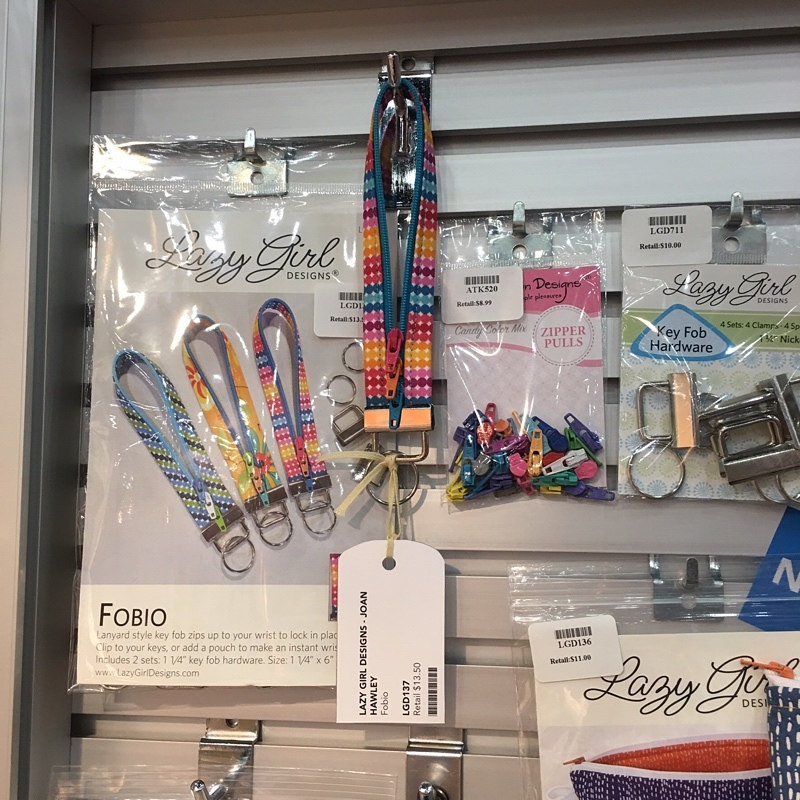 Jenny’s awesome Quick Curve Ruler has been a huge hit for several years and now she’s designed a Quick Curve Mini ruler and five patterns for Mini Quilts. One of these days, I’m going to attend a Sue Spargo Workshop. It’s a “stitchy bucket list” item. Until that happens, I am just going to drool over this book. Maybe not this one… since the book isn’t available yet, the formerly-nice ladies at Martingale wouldn’t let me touch this sample copy. 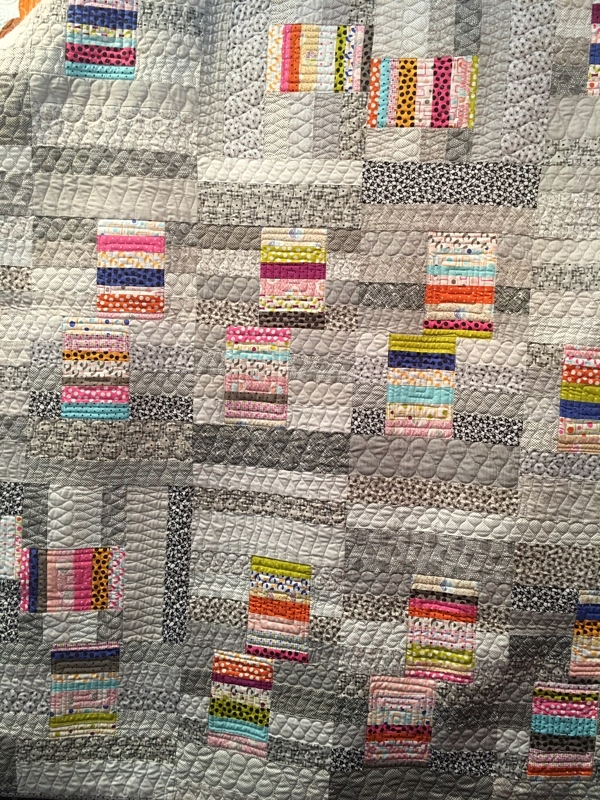 Color-walls and “rainbows” were a popular visual at Quilt Market – this is one of my favorites. It’s by Aurifil. For obvious reasons, this is my other favorite. 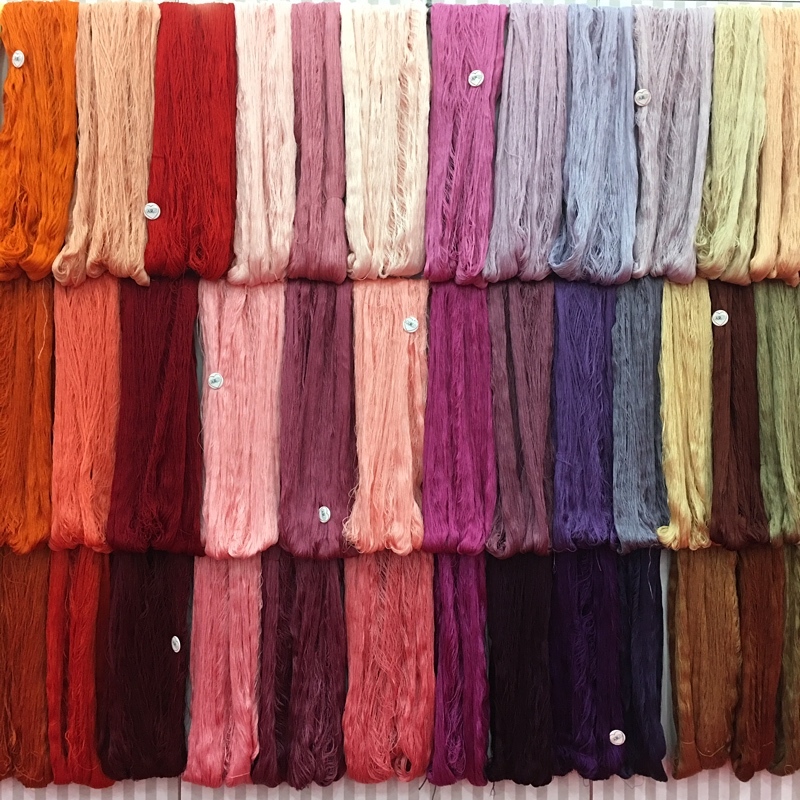 The Moda color-cascade was created by Lissa Alexander. The taking of the picture of the designers for Moda fabrics. I’ll have a “better” picture later – the official picture. But this is my favorite picture for obvious reasons – it’s just funny. And sweet – these people are the friends and family of the folks on the other side. Those who don’t have family here have usually given their phones/cameras to someone for a picture. My other favorite picture is from the Moda Party. Hazel Rosenthal and Joanna Figueroa. Those adorable little outfits made with Summerfest fabric hanging in April Rosenthal’s booth belong to this little angel. But I’ll bet the farm that she gets something made with Strawberry Fields Revisited soon. More soon – it’s the wee hours and I have one more day to go. Thanks, Carrie ! Your pictures and commentary are priceless ! Thank you so much for sharing the experience. I miss being there and your posts bring the fun and emotion back to me. 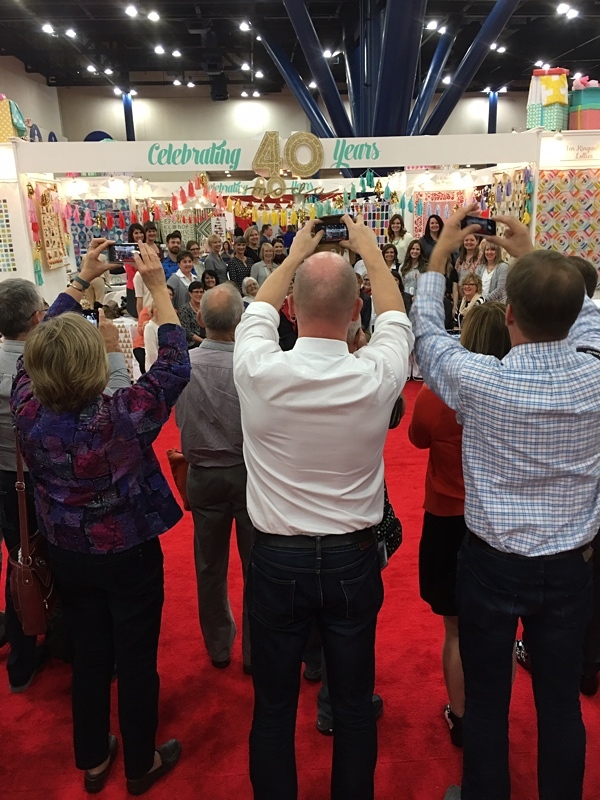 You’ve wowed us once again with a wonderful recap of the happenings at quilt market. What fun for Moda, celebrating 40 years. I’m chuckalucka full of inspiration after reading this post and drooling over all the beautiful pictures. Fabulous posts from market! Can’t wait to get to my iPad every day to see what you have ready to share! Thanks so much for providing us with such awesome Moda inspiration! 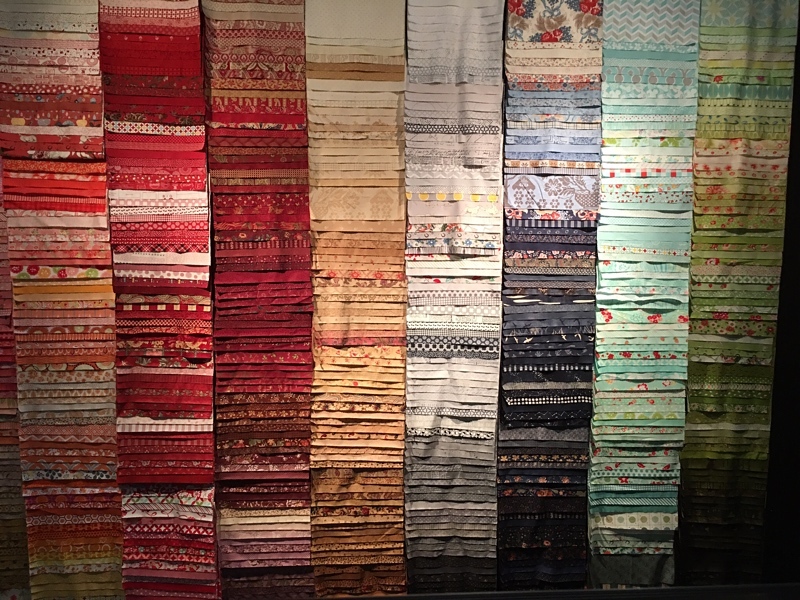 Since the displays are now down from market, and each market has a new theme, can I call dibs on the color cascade display of Moda fabrics. Gorgeous, and it provokes a serious craving. Thanks for your market reports. 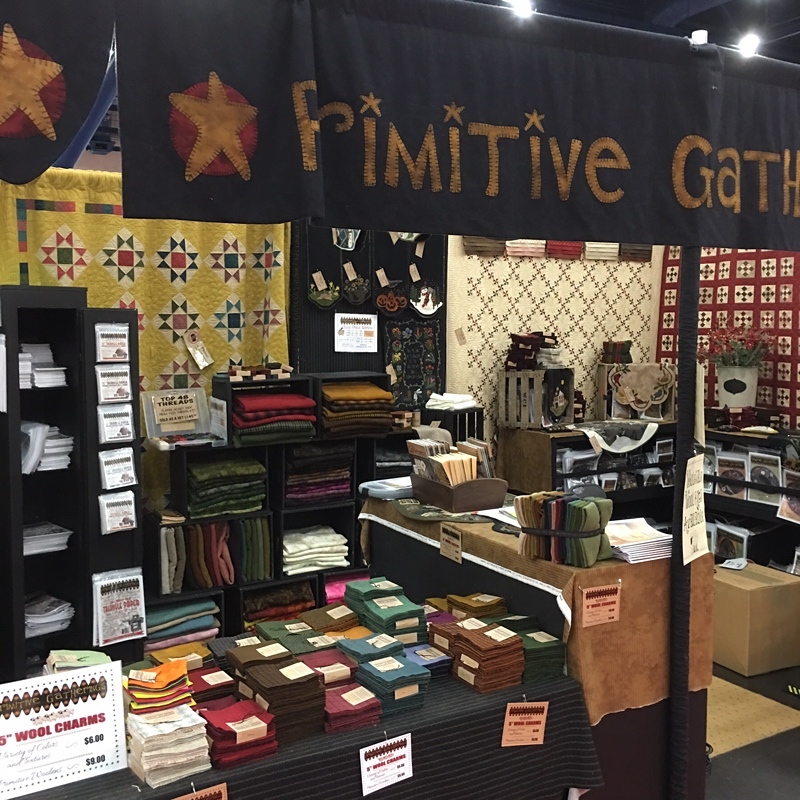 Thanks for the insight into Quilt Market – I was watching some Facebook videos posted by Pat Sloan and others from market – what a huge show it was! Thank you soooooo much Carrie! Your pictures and comments were so fun to see/read! Will look forward to more in the next week or so! Thanks so much for the updates! I am eager to get so many of these new lines, patterns and notions! Thanks so much…you make everything such fun, even from afar! As always you never disappoint with your post. I am hoping some day to actually get to attend Quilt Market. I am so close yet so far! Congrats on the anniversary for Moda, 40 years, that is quite an accomplishment! 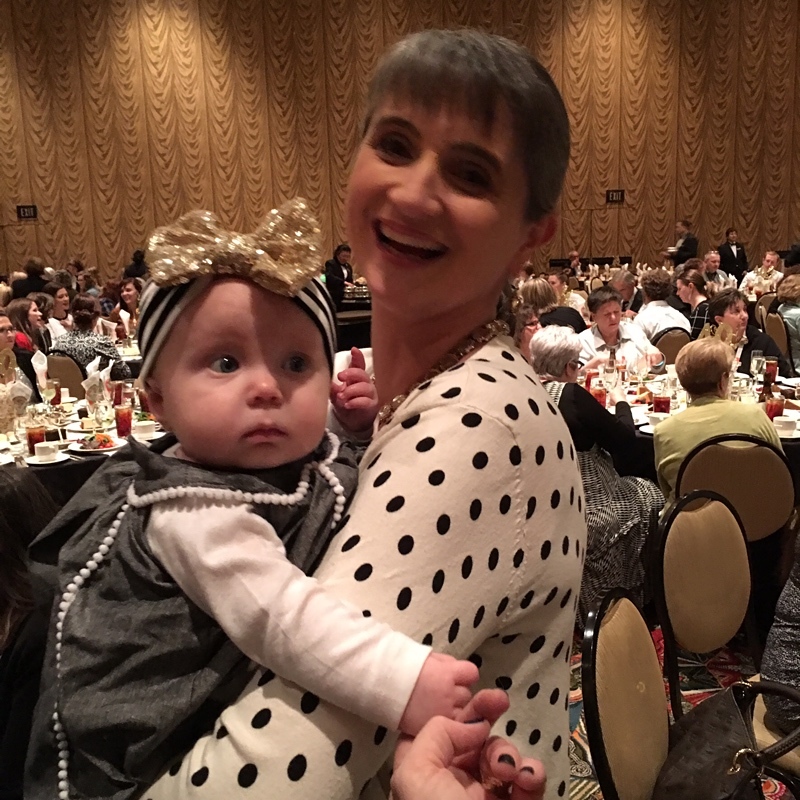 Thanks for the great post Carrie! I feel like I’ve been to Market! I haven’t been in about 10 years, when I worked for a shop – but boy, has it grown, and changed for the better! I remember then when some folks were saying quilting had peaked then. HAH !! I’m looking forward to QF this weekend,, always flies by much too fast ! Any word on that house quilt that was posted on Instagram? I thought a pattern just needed a final proof. I’m dying to make it.